One of the questions I get asked most frequently when I tell people I’m a writer is where do I get my ideas from. It’s not an easy answer to give because in truth, my ideas come from everywhere. Almost anything can spark an idea or inspire a burst of creativity. The trick is to see the potential in these ideas and nurture them into an article or a story. I’m lucky to live on a boat just outside of Rome, which provides me with endless inspiration to write and create. I’m drawn to the sea and working comfortably in the cabin as I float around really suits my style. I love feeling all the elements on the boat. My work in progress is a young adult novel set under the ocean. When there’s a violent storm and the boat is surging in the marina, I take the opportunity to imagine what it must feel like for my characters below the surface. * Peaks and troughs of life afloat – The highs and lows of living on a boat. * Traditional roles in relationships. Do they still have a place in 2015? – As I’m here doing a ‘pink’ job, my boyfriend is at home on the boat doing the arguably ‘blue’ job of an engine oil change. * Italian Daily Style – All the people walking past the launderette have obviously made an effort to be well groomed before leaving home today. * Graffiti – is it art or vandalism? -The unusual paintings on the building opposite have caught my attention on many trips here. * All roads lead to Rome? – Watching the cars bang into the huge potholes outside reminds me of the scandal in Italy where corruption has meant taxpayer’s money destined for the road infrastructure hasn’t reached the roads. I could even watch the washing machines and see the water sloshing around erratically and be inspired for my novel, I could write about my characters getting caught in a giant whirlpool. These ideas might not seem to be the most original, but the trick is to make your viewpoint as interesting as possible. If you’re stuck finding something to write about take a look at your surroundings. Something you find entirely ordinary may well be extraordinary for someone else. 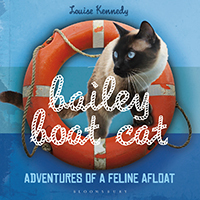 Bailey Boat Cat came from my desire to write about our life living on a boat from an original viewpoint. (There are hundreds of generic blogs about this.) I realised Bailey’s perspective was very different from ours. Initially it was just a way for me to be creative daily and chronicle our life afloat but people love it because it’s different and depicts our, admittedly unusual, lifestyle creatively. This entry was posted on Friday, March 20th, 2015 at 9:30 am	and is filed under finding ideas. You can follow any responses to this entry through the RSS 2.0 feed. Both comments and pings are currently closed.